Interior features an attractive American Oak wood finish with carpeted back cover and walls. 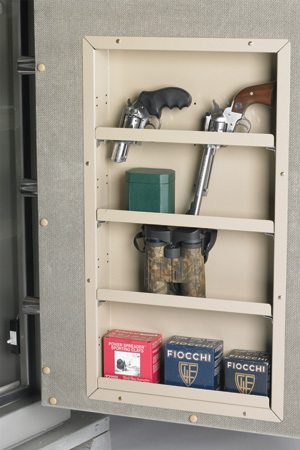 Includes one adjustable shelf and an eleven-gun storage rack. Brass spy-proof dial with decorative brass “L” handle accompanied by the renowned American Security Products solid brass logo plate. Sleek style is designed to fit into a closet. Mercury Class I fire at 1000° F, for a period of 20 minutes. Designed to maintain an interior temperature of less than 350°F. High strength unitized 12 ga. body and 3/16" thick solid steel recessed door. 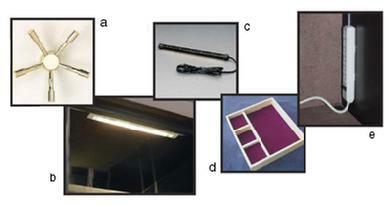 (5924W's door is 1/4"). protected by a drill-resistant hard plate. 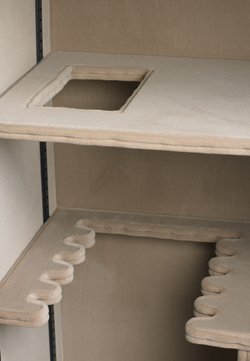 2 pre-cut anchor holes with mounting hardware included, and 2 pre-cut electrical access holes. The quality-packed, affordably-priced LP Series offer an unbeatable value, featuring a new all-velour interior including back cover and fire walls. Black textured finish with bold zinc, die-cast polished brass logos. Polished brass, spy-proof dial and "L" handle. 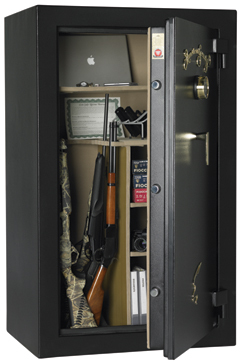 External hinges easily provide full access to your safe. High strength unitized 12-gauge solid steel body. Massive 1-3/4" recessed door constructed of a solid 1/4" solid steel plate and a fire insulating material. 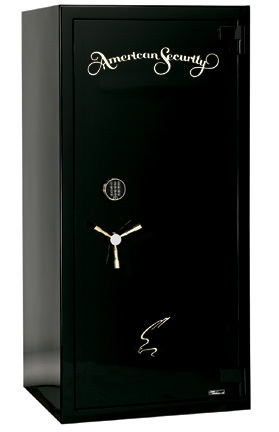 Equipped with a Group II, key-changeable combination lock with an internal re-locker and brass spy-proof dial and ring. ON ELECTRONIC MODELS (E): Equipped with an ESL10XL UL Listed Type I Electronic Lock with polished brass keypad. 3-way boltwork with 5 active 1-1/4" diameter chrome-plated steel locking bolts and three 1-1/4" deadbolts. 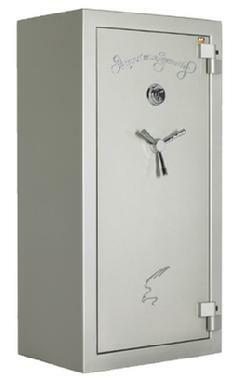 Each safe offers 4 pre-cut anchor holes and 1 pre-cut electrical access hole. The LP6036, LP5924, LP6032 and LP6030 offer fire protection of 1200°F for a period of 45 minutes. Designed to maintain an interior temperature of less than 350°. Palusol™ door seal expands up to 8 times its original thickness when exposed to high temperatures sealing safe contents from harm. NEW ITEM! All-velour interior and cut-out in top shelf for long guns. Equipped with a U.L. listed group II lock protected by a massive hardplate and internal re-locker. Mercury class II fire protection of 1275 degrees for 90 minutes. Designed to maintain an interior temperature of less than 350 degrees. Unique mirrored back wall in the interior of the safe providing higher interior visibility. Select from five hand-painted high-gloss, four textured finishes (Sandstone and Granite updated) and Two-Tone finish (Onyx High Gloss door, Black Textured body). Upholstered in our standard plush tan pin-dot fabric. Fire rated at 1850ºF for a period of 2 hours. Designed to maintain an interior temperature of less than 350°F. Massive 31/2" thick body encloses a high security fire resistant material to protect against intense fires. U.L. Listed burglary resistant TL-30 model is built to withstand severe attacks from the sophisticated equipment used by today's burglars. Massive 3-1/2" body and 2-3/4" door (total door thickness: 5-3/4") built with a defense barrier of outer and inner steel plates creating a single structure enclosing a unique, burglary resistant high security material. Equipped with a U.L. Listed Group 2M lock protected by a massive drill shattering hard plate and two additional spring-loaded relocking devices. 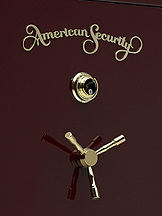 10 Massive 1-1/2" diameter chrome plated solid steel locking bolts provide superior door security. Built with 16 ga. steel. 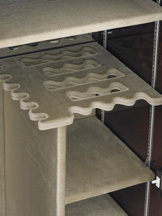 Features two hand gun storage slots and raised edge on all shelves keep items in place. Convenient storage space. Two Fluorescent lights. Vertically inset in back wall for lower compartments and upper light for top area. 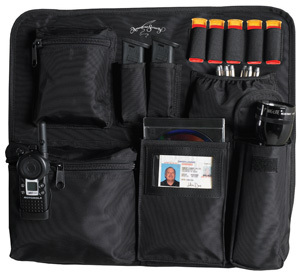 Ideal for organizing pistols inside your safe. 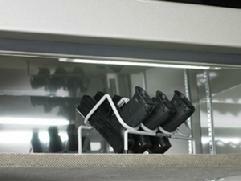 This four gun pistol rack sits on top of an interior shelf. 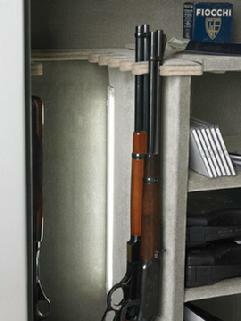 Will constantly guard your guns against the threat of rust, pitting and moisture damage. Electrical access is required. 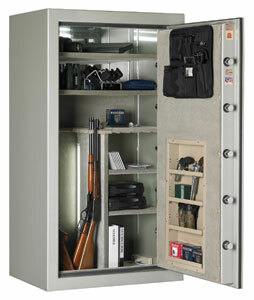 Tray conveniently fits into every safe. Burgundy felt lined. Prevents rust & moisture damage. Recommended for safes without electrical access.